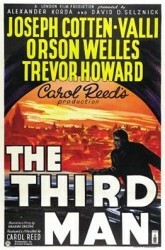 Silver screen classic “The Third Man” was shot in Vienna in 1948. It is considered to be the greatest film of all time. A brand new release of “The Third Man” will be presented in selected cinemas to audiences fully restored in 4k resolution from 26 June. This year also marks the 100th birthday of Orson Welles, who played Harry Lime. The Third Man is a 1949 British film noir, directed by Carol Reed and starring Joseph Cotten, Alida Valli, Orson Welles, and Trevor Howard. It is considered one of the greatest films of all time, celebrated for its atmospheric cinematography, performances, and musical score. This article includes a total of 788 words.